The Ponseti method for clubfoot treatment was described for children up to 6 months by Ponseti, 1996. In 2004, Morcuende et al., concluded that the treatment was also efficient for children up to 2 years old. In 2001, Pirani studied the remodeling of cartilage in infants undergoing treatment with the Ponseti method. A magnetic resonance imaging (MRI) protocol was developed. Joint congruency is maintained while remodeling occurs through serial casts. ”Neglected” or after walking age clubfeet can also be corrected with the Ponseti method as shown in the recent literature.,,,,, Remodeling in those patients has not yet been sequentially documented concerning joint congruency and morphologic changes in cartilage anlagen. Four sequential MRI studies are studied following Pirani's protocol for infants, taken before, during and two of them after Ponseti treatment of a 7-year-old child and cartilage changes, joint orientation and position of the foot are compared. How does cartilage anlage change at 2, 5, and 18 weeks during treatment? Are those changes maintained after 2.5 years? Is joint congruency maintained during Ponseti treatment? Does the Achilles tendon heal and remodel as well as the cartilage? This a prospective study performed in Sao Paulo, Brazil. A 7-year-old child with untreated bilateral clubfoot was treated with the Ponseti method in 2010 after informed consent was obtained. The treatment followed the same principles as applied in infants by Laaveg and Ponseti and Ponseti: elevation of the first ray to correct cavus deformity followed by abduction of the foot, always with counter pressure in the lateral part of the talar head. The abduction at the last cast should be maximum, with the talar head completely covered. Long leg casts with the knee in 90° of flexion were changed every week. Seventy degrees of abduction was the position obtained in the last pair of casts (10th). After that, the patient underwent bilateral complete Achilles tenotomy and anterior tibial tendon transfer to the third cuneiform. Long leg casts were applied after surgery and kept for 6 weeks. Foot abduction brace was recommended for night time use for a year postoperatively. The same MRI protocol devised by Pirani to image the anatomical abnormalities in newborns was used in this study. General anesthesia was not needed nor was sedation. The feet were placed within an adult knee coil. Fast spin echo T1- and T2-weighted sequences were used (short in duration) with good contrast between bone and cartilage. Slice thickness was 3 mm. Studies were performed in a high field strength magnet (Avanto/Skyra; Siemens 3.0 Tesla, Erlangen, Germany). Images were obtained based on a perpendicular plane from the joint of interest (calcaneocuboid, ankle, talonavicular, and subtalar joint) [Figure 1]. Sagittal plane images were obtained from a coronal scout perpendicular to bimalleolar axis. Oblique axial images from a coronal scout perpendicular to talonavicular joint and oblique axial images from a coronal scout perpendicular to calcaneocuboid joint. Oblique coronal images were taken from a coronal scout perpendicular to subtalar joint. The first images of both feet were obtained before treatment, the second after the 5th cast (5th week), the third on the 18th week, 2 weeks after the removal of the last cast and postanterior tibial tendon transfer and Achilles tenotomy. The last MRI was performed 2.5 years posttreatment. Characterization of clubfoot deformity shows important talus plantar flexion in the sagittal view. The ossific nucleus of the talus is not central in the talus cartilage anlage, talar neck has an abnormal inclination. 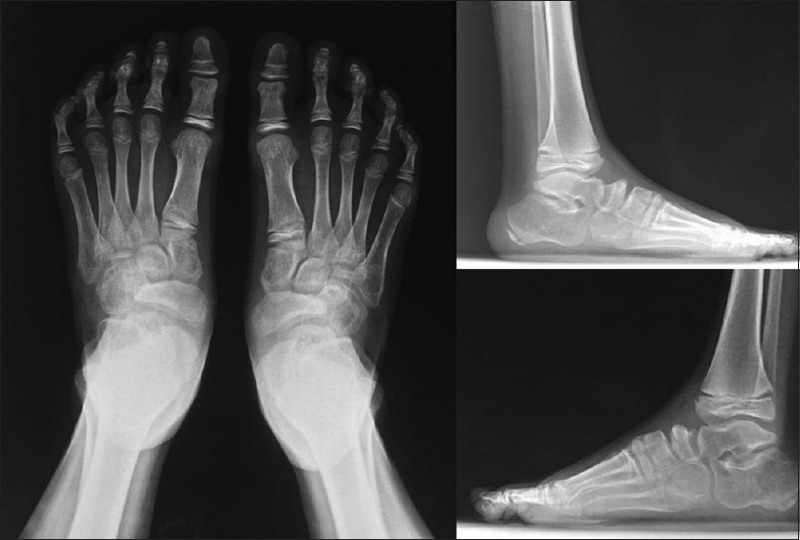 The oblique coronal plane shows the navicular bone dislocated medially and wedge shape and the cuboid is also medially dislocated. In the axial view, the navicular and anterior calcaneus are cartilaginous [Figure 2]. In the sagittal plane intense remodeling can be observed, and maintenance of joint congruency is shown in four phases: pretreatment, in the 5th week, at 18 weeks (2 weeks after removal of surgical casts) and 2.5 years follow-up. Healing after Achilles tenotomy is complete at 18 weeks [Figure 3] and [Figure 4]. In the foot coronal sequences, the talonavicular realignment is demonstrated as well as calcaneocuboid joint realignment in the axial views [Figure 5], [Figure 6], [Figure 7]. After 5 weeks treatment, sagittal plane images show important correction of hindfoot equinus and talus orientation and improvement of the tibial-talar contact. Calcaneocuboid joint orientation also changed about 60 degrees becoming more vertical. After 18 weeks images demonstrate correction of the tibiotalar plantar flexion, normal congruency of the talonavicular and subtalar and complete healing of Achilles tendon. Those cartilage/bone changes are maintained after 2.5 years and the foot is plantigrade. MRI studies after treatment show good congruency, and reduction of talonavicular, talocalcaneal and calcaneocuboid joints. Healing of Achilles tendon is documented after 8 weeks of complete tenotomy, and anterior tibial tendon transfer can be identified inserted to the third cuneiform. Comparing the infant's images from Pirani's study (2001), our study shows similar remodeling even without big cartilage anlages seen in babies. Clinical results are satisfactory, with stable and plantigrade clubfeet, with aesthetic and functional outcomes very close to normal [Figure 8]. Radiographs of pre- and post-treatment are shown in [Figure 9] and [Figure 10]. Those studies elevate the upper age limit for using the Ponseti method and also the limit of remodeling of cartilage anlagen and bony structures. In the 7-year-old boy, the observed changes after the first 5 weeks of treatment are similar to the changes described in newborns. This was obtained with application of Ponseti protocol with no changes and concentration on the moulding of the foot and stretching of medial and posterior and medial soft tissues. The understanding of the chondroosseous changes during treatment by Ponseti Method can be based on the viscoelastic behavior of the ligaments and tendons, and the creep strain phenomenon that occurs during manipulation. “The cast is applied with the same pressure used during manipulation. As with all viscoelastic materials, stress relaxation would take place in the cast, effectively redistributing stresses within the tissues until the next manipulation and casting…” Mosca also reinforces the importance of the unique stiffness of the individual child's foot, the age at which the treatment is initiated and the skill of the practitioner to obtain a successful correction. Extensive remodeling can occur even in the cases of mild talar flattening because the amount of talus flattening that will prevent adequate correction with serial casts is not yet documented. That is why it is so important to follow and document critically the progression of correction after each cast. Cases do not respond the same way, some will respond better and faster, others not so. Brand et al. performed an MRI volumetric study of anlagen in clubfoot correction and documented the deformation of the soft anlagen with the constant pressure of the cast and stretch of the ligaments. In 1 week, the anlagen assumed a new “deformity” shape not returning elastically to its original shape before casting. However, the tissues in clubfoot are known to grow less than in a normal foot, those authors found that the abnormal talus anlage grows faster and more than the normal, as if it would have been decompressed. This could also explain the cartilage changes during Ponseti treatment. 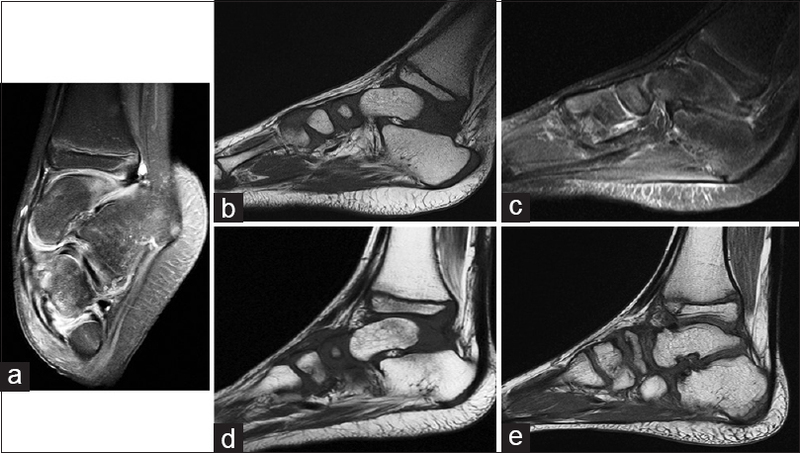 Complete tenotomy can be safely performed, the healing of the tendon resumes in 3−4 weeks (shown in MRI images after 8 weeks of surgery). In the clubfoot deformity, the Achilles tendon is not the only structure restricting dorsiflexion: there is an important retraction of ligaments and capsule that does not allow for free dorsiflexion, even if the Achilles is completely transected. The age limit for a complete tenotomy has yet to be defined, but mature clubfeet have been treated with total resection of the tendon, and none of those (previously non-operated feet) reported to be overcorrected to a planovalgus foot, or to have a weak Achilles tendon. Tenotomy should not be replaced by posterior release. Posterior releases cause fibrosis and loss of dorsiflexion as healing occurs. Furthermore, the little extra dorsiflexion gained with this extensive procedure could be lost. Only in the case of tenotomy not been able to completely correct the equinus, then posterior release could be an option. Important to remember that abduction corrects the equinus in the subtalar joint and only of the rest of correction should depend on posterior structures in the ankle. The anterior tibial transfer is a usual procedure in recurrent cases of clubfoot but can be an excellent tool to complement clubfoot treatment in older children. 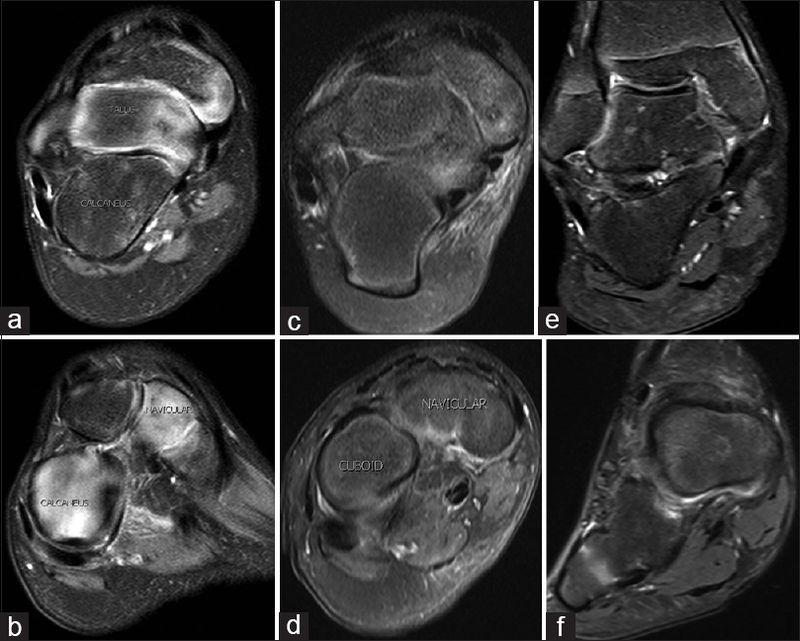 The entrance of the anterior tibial tendon in the third cuneiform and its correct incorporation into the bone can be demonstrated by MRI images 8 weeks after surgery. Bracing is a crucial part of the Ponseti method and proper motivation and education of parents mitigates the chances of losing correction. Not using foot abduction brace will increase the risk of relapse seventeen times After 2.5 years, this patient maintained correction and used night time brace for a year. Osteopenia after prolonged casting can be a serious problem in patients after walking age. Stress fractures can be painful and be responsible for a delay in resuming walking. The images after 8 weeks of surgery (18 weeks of treatment) show those changes − stress fractures − with a halo of inflammatory reaction. Osteopenic changes are completely resolved in the images after 2.5 years of treatment; patient recovered and walked without any complaints. Additional follow-up is necessary to observe if this remodeling in this age has a price to pay in the future, vis-a-vis arthritic changes. This study had a number of limitations; the MRI cuts are similar but not exactly the same as the ones in newborns. However, as they are perpendicular to the plane of the specific joints, they can show remodeling and congruency. This boy had bilateral clubfeet; maybe, in unilateral disease, the contralateral normal side could be compared with the treated clubfoot. It would be interesting to measure cartilage volumes in true three-dimensional imaging, which can document remodeling more efficiently. Intense cartilage remodeling and maintenance of joint congruency have been shown during and after Ponseti treatment in a neglected 7-year-old clubfoot. Hence we prove that it is possible to treat older children with Ponseti Method resulting in a functional, pain-free, plantigrade foot, with good mobility. We would like to thank Sirio Libanês Hospital Radiological Department for the MRI images studies pro bono through its philanthropic activities. Ponseti IV. Clubfoot: Fundamentals of Treatment. New York: Oxford University Press Inc.; 1996. p. 61-97. Tindall AJ, Steinlechner CW, Lavy CB, Mannion S, Mkandawire N. Results of manipulation of idiopathic clubfoot deformity in Malawi by orthopaedic clinical officers using the Ponseti method: A realistic alternative for the developing world? J Pediatr Orthop 2005;25:627-9. Bor N, Herzenberg JE, Frick SL. Ponseti management of clubfoot in older infants. Clin Orthop Relat Res 2006;444:224-8. Lourenço AF, Morcuende JA. Correction of neglected clubfoot by Ponseti method. J Bone Joint Surg Br 2007;89:378-81. Lavy CB, Mannion SJ, Mkandawire NC, Tindall A, Steinlechner C, Chimangeni S, et al. Club foot treatment in Malawi − A public health approach. Disabil Rehabil 2007;29:857-62. Nogueira MP, Ey Batlle AM, Alves CG. Is it possible to treat recurrent clubfoot with the Ponseti technique after posteromedial release? : A preliminary study. Clin Orthop Relat Res 2009;467:1298-305. Pirani S, Naddumba E, Mathias R, Konde-Lule J, Penny JN, Beyeza T, et al. Towards effective ponseti clubfoot care: The uganda sustainable clubfoot care project. Clin Orthop Relat Res 2009;467:1154-63. Spiegel DA, Shrestha OP, Sitoula P, Rajbhandary T, Bijukachhe B, Banskota AK, et al. Ponseti method for untreated idiopathic clubfeet in nepalese patients from 1 to 6 years of age. Clin Orthop Relat Res 2009;467:1164-70. Adegbehingbe OO, Oginni LM, Ogundele OJ, Ariyibi AL, Abiola PO, Ojo OD, et al. Ponseti clubfoot management: Changing surgical trends in Nigeria. Iowa Orthop J 2010;30:7-14. Khan SA, Kumar A. Ponseti's manipulation in neglected clubfoot in children more than 7 years of age: A prospective evaluation of 25 feet with long-term follow-up. J Pediatr Orthop B 2010;19:385-9. Nogueira MP, Pereira JC, Duarte PS, Lourenço A, Tedesco AP, Ferreira LA, et al. Ponseti brasil: A national program to eradicate neglected clubfoot-preliminary results. Iowa Orthop J 2011;31:43-8. Yagmurlu MF, Ermis MN, Akdeniz HE, Kesin E, Karakas ES. Ponseti management of clubfoot after walking age. Pediatr Int 2011;53:85-9. Verma A, Mehtani A, Sural S, Maini L, Gautam VK, Basran SS, et al. Management of idiopathic clubfoot in toddlers by Ponseti's method. J Pediatr Orthop B 2012;21:79-84. Banskota B, Banskota AK, Regmi R, Rajbhandary T, Shrestha OP, Spiegel DA, et al. The Ponseti method in the treatment of children with idiopathic clubfoot presenting between five and ten years of age. Bone Joint J 2013;95-B: 1721-5. Derzsi Z, Gozar H, Gurzu S, Prisca R, Nagy O. Congenital clubfoot in children after walking age: Management and evaluation of 41 feet with the dimeglio score. J Clin Diagn Res 2013;7:2841-3. Ford-Powell VA, Barker S, Khan MS, Evans AM, Deitz FR. The Bangladesh clubfoot project: The first 5000 feet. J Pediatr Orthop 2013;33:e40-4. de Podestá Haje D. Neglected idiopathic bilateral clubfoot successfully treated with the Ponseti method: A Case report. JBJS Case Connect 2013;3:e9. Palma M, Cook T, Segura J, Mayo L, Morcuende JA. Barriers to the ponseti method in peru: A two-year follow-up. Iowa Orthop J 2013;33:172-7.
van Bosse HJ. Treatment of the neglected and relapsed clubfoot. Clin Podiatr Med Surg 2013;30:513-30. Hassan MK, Ibrahim AH, Mostafa MM, Bakr HA. Ponseti method for management of neglected idiopathic clubfoot. Curr Orthop Pract. 2013;24:295-7. Qureshi AR, Warriach SB. Evaluation of Ponseti method for management of idiopathic clubfoot in toddlers. PJMHS 2013;7:730-2. Ayana B, Klungsøyr PJ. Good results after ponseti treatment for neglected congenital clubfoot in Ethiopia. A prospective study of 22 children (32 feet) from 2 to 10 years of age. Acta Orthop 2014;85:641-5. Faizan M, Jilani LZ, Abbas M, Zahid M, Asif N. Management of idiopathic clubfoot by Ponseti technique in children presenting after one year of age. J Foot Ankle Surg 2015;54:967-72. Bashi RH, Baghdadi T, Shirazi MR, Abdi R, Aslani H. Modified Ponseti method of treatment for correction of neglected clubfoot in older children and adolescents − A preliminary report. J Pediatr Orthop B 2016;25:99-103. Sinha A, Mehtani A, Sud A, Vijay V, Kumar N, Prakash J, et al. Evaluation of Ponseti method in neglected clubfoot. Indian J Orthop 2016;50:529-35. Mehtani A, Prakash J, Vijay V, Kumar N, Sinha A. Modified Ponseti technique for management of neglected clubfeet. J Pediatr Orthop B 2018;27:61-6. Pirani S, Zeznik L, Hodges D. Magnetic resonance imaging study of the congenital clubfoot treated with the Ponseti method. J Pediatr Orthop 2001;21:719-26. Gray K, Pacey V, Gibbons P, Little D, Frost C, Burns J. Interventions for congenital talipes equinovarus (clubfoot). Cochrane Database Syst Rev 2012;18(4). Mosca VS. The foot. In: Morrisey RT, Weinstein SL, editors. Lovell and Winter's Pediatric Orthopaedics. Philadelphia: Lippincott Williams and Wilkins; 2001. p. 1152-213. Brand RA, Siegler S, Pirani S, Morrison WB, Udupa JK. Cartilage anlagen adapt in response to static deformation. Med Hypotheses 2006;66:653-9.